Ohio Parks and Recreation Association (OPRA) has announced its 2018 Annual Awards of Excellence winners. 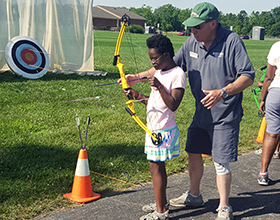 The Centerville-Washington Park District won a first place award in the programs for special populations category for Adapted Action Day, a new event held at Oak Grove Park this summer. Adapted Action Day was planned for individuals with special needs and their families. The event was created to demonstrate that recreational activities can be for everyone. The day’s activities included fishing, archery, kickball, biking and crafts – all adapted for inclusivity. Synergy Family Therapy provided volunteer support, communication with local families and games on the day of the event. GreeneBucs brought their adaptive bicycles for children to try. Several University of Dayton Physical Therapy Doctoral Program students volunteered their time to make the event a success. The OPRA Annual Awards of Excellence will be presented at a banquet hosted by the association on February 5, 2019, at the Kalahari Convention Center in Sandusky, Ohio. One first place award winner will be presented with the 2018 Governor’s Award for Parks and Recreation, a “best-in-show” award. A panel of parks and recreation professionals from around Ohio judge the OPRA Awards of Excellence.